In German with English subtitles. This is a VHS transfer. Also known as The Man Who Murdered and The Man Who Committed the Murder. 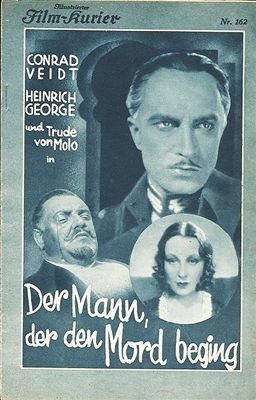 Set in pre-WWI Constantinople, the story concerns French diplomatic attache Conrad Veidt, who seduces Trude von Molo, the wife of British aristocrat Heinrich George. Confronted by George, Veidt kills the man, then turns himself in to the authorities. But will he stay there? Director Kurt Bernhardt regarded Der Mann der den Mord Beging as one of his best films, not so much because of what happens in the film, but because of the omnipresent atmosphere of tension over what might happen.